For the 5th consecutive year the “Sustainability Forum 2016, a training, networking and professional development event” by Global Sustain, was completed with great success on October 7, at the OTE Academy premises. Participations exceeded expectations, with guest speakers of international prestige and profile, but also high level attendees representing almost all sectors of economic activity. Participants from all around the world exceeded 75, and had the opportunity to attend specialized workshops and listen to internationally renowned speakers and experts in sustainability issues, acquiring knowledge about major issues and international trends, interacting with each other in a continuous, all-day networking. In the opening session, Mr. Aris Vrettos, Director of The Prince of Wales’s Business and Sustainability Programme, Director of Open Programmes, University of Cambridge Institute for Sustainability Leadership (CISL), spoke about the ever changing role of business in society in conjunction with political, socio-economic and technological developments in the Anthropocene era. Dr. Bruce Piasecki, President & CEO AHC Group, Inc, explained to the participants the importance of sustainable capitalism and creating shared value, making reference to the growing importance of ESG criteria (Environmental, Social and Governance) for investors. Dr. Jeremy Pearce, Research Associate, Global Sustain, spoke about managing up sustainability strategy to senior executives. Mrs. Kiara Conti, Climate Change and Sustainability Services, EY, spoke about measurement and valuation of extra financial aspects of value creation. According to Mrs. Konti, the concept of value is broadening to encompass resources that are shared between an organization and wider society, with emphasis on intangibles assets such as people and innovation. Mrs. Shivani Rajpal, Deputy Director Services, GRI, described the UN Sustainability Goals and referred to the GRI contribution to the implementation of the SDGs by businesses, through the SDG Compass. O Dr. Christian Avérous, Vice-President, Blue Plan and former head of Environmental Performance and Information, OECD, reported on the international framework for sustainable production and consumption, with particular reference to case studies of businesses around the world. Mrs. Alka Banerjee, Managing Director, S&P Dow Jones Indices, talked about measuring sustainability with the Dow Jones Sustainability Indices, referring to international trends but also on sustainable investments. Mr. John Zeppos, FBCI Managing Director, Resilience Guard GmbH, emphasized the need for risk management culture to ensure business continuity and sustainability. Mr. Todd Fein, Chief Executive Officer, Green Diamond, LLC, spoke about the role of technology and Big Data on sustainability, with special reference to corporate practices. Mr. Sebastian Fairhurst, Head of Public Policy Germany, Santander Consumer Bank AG and Yannis Salavopoulos, Managing Director, Global Sustain GmbH & Group Head Int. Affairs, highlighted the importance of public affairs and sustainability strategy in order to improve corporate performance (risk management, corporate reputation, revenue growth, cost reduction). Mr. Tero Pietila, Head of Division Corporate Social Responsibility, European Investment Bank, provided an overview of the organization’s CSR strategy, with particular reference to the financing programs and “green bonds”. Mr. Gabriel Karageorgiou Head of Client Services, Partner, Arabesque Partners, analyzed the role of ESG criteria in investment decisions. Mr. Gerasimos Georgopoulos, Head on Institutional Regulations (Company Law) & Business Registry (GEMI), Ministry of Economy, Development & Tourism, General Secretariat of Commerce & Consumer Protection, D.G. Market, D. Enterprises & Business Registry (GEMI), analyzed the new European Directive on the disclosure of non-financial information, providing explanations on transposition issues (deadlines, report content, companies covered by the Directive). Mrs. Stavroula Aggelopoulou, Corporate Responsibility Senior Manager and Mr. Costas Provataris, Enterprise Risk Management Senior Manager, OTE Group, spoke about integrating materiality assessment into Enterprise Risk Management. At the end of the Forum, participants received certificates of attendance and had the opportunity to network with each other. The next Sustainability Forum is scheduled for October 6, 2017. Further information about the Sustainability Forum is available at www.sustainabilityforum.gr. Silver Sponsors: Alpha Bank, Interamerican. Institutional Supporters: American-Hellenic Chamber of Commerce, British Hellenic Chamber of Commerce, CEO Clubs International, Hellenic Management Association, Hellenic Fund and Asset Management Association, Institute of Communication, Hellenic Corporate Governance Council, Hellenic Advertisers Association, Safety for Sea, The Hellenic-Dutch Association of Commerce and Industry, Union of Listed Companies. Almost three weeks left, until the 5th «Sustainability Forum 2016, a Τraining, Networking and Professional Development Event». 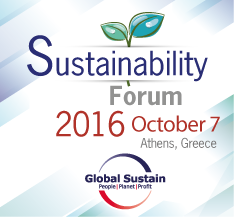 The Forum, is organised by Global Sustain and will take place on October 7th, at the OTEAcademy, in Athens. Just like the previous years, internationally renowned speakers and experts on sustainability issues will participate in the Forum, coming from organisations such as: OECD, European Investment Bank, GRI, University of Cambridge, Hellenic Republic Ministry of Economy, Development & Tourism, AHC Group, OTE Group, Resilience Guard, Arabesque Partners, Green Diamond, Santander Consumer Bank, EY, and S&P Dow Jones Indices. The speakers, through nine specialised workshops and five sessions will share their knowledge and experience with the attendees. Anthropocene, sustainability and the role of businesses. Public Affairs and sustainability strategies for growth. Adapt or fail? For further information about the registration and sponsorship opportunities please visit http://sustainabilityforum.gr/. Continuous updating of the Forum is available on the official Facebook page Sustainability Forum. Global Sustain, celebrates 10 years of operation and gives 10 free invitations for the Sustainability Forum 2016 to registered unemployed, through a special electronic contest. The “Sustainability Forum 2016, a training, networking and professional development event” organised by Global Sustain will take place on October 7 at the OTE Academy premises in Athens, for the fifth consecutive year. Prominent speakers from all around the world will participate in the Forum, coming from organisations such as: OECD, EIB, GRI, Cambridge University, Hellenic Republic Ministry of Economy, Development & Tourism, OTE Group, AHC Group, Resilience Guard, Arabesque Partners, Green Diamond, Santander Consumer Bank, EY, S&P Dow Jones Indices. They will share their knowledge and expertise with the attendees, through specialised workshops and sessions. Αnthropocene, sustainability and the role of businesses. Sustainable capitalism and creating shared value.Doing more with teams. Managing up sustainability strategy to senior executives. EY’s Total Value; Measurement and valuation of extra financial aspects of value creation. The global framework for sustainable consumption and production. Measuring sustainability with the Dow Jones Sustainability Indices. Resilience and sustainability: The two sides of the same coin. How well is your sustainability data and technology working for you? Measure, manage, and innovate with intent. Public affairs & sustainability strategies for growth. Adapt or fail? Corporate Social Responsibility: Perspectives from an international financial institution. Integrating ESG issues in investment decision-making. Transposing the EU directive on the disclosure of non-financial information into national law: The case of Greece. Integrating materiality assessment into Enterprise Risk Management. The Sustainability Forum 2016 brings together high-level professionals, such as: general managers, process managers, sustainability professionals, CSR practitioners & managers, chief financial officers, HR and corporate affairs managers, PR specialists, marketing managers, communication experts, investors, environmental engineers, sustainability analysts, IT engineers, project managers, legal advisors, management systems auditors, quality assurance specialists, NGO’s staff, students etc. Discussions and views about the Forum will be accommodated in the LinkedIn group on, Global Sustain Sustainability Forum. Participants receive a certificate of attendance. Program Registration Fee is eligible for LAEK/OAED funding. Supporters: AHC Group, Berling, CAPITALS Business Circle, DEPA, European Reliance, Fisikon, Gilead, Kentriki Odos, Nea Odos, Philips. Carbon Offset Partner: Green Evolution. Web & Social Media Partner: Think Plus. Communication Partners: 3BL Media, CSRwire, Ethical Performance, Asian NGO, Governance & Accountability Institute, Sustainability HQ, accountabilitycentral.com, Re:CSR, CSR Week, csrnews.gr, Marketing Week, Plant Management, marketingweek.gr. Institutional Partners: Athex Group, British Hellenic Chamber of Commerce, CEO Clubs, Hellenic Advertisers Association, Hellenic-Dutch Association of Commerce and Industry, Institute of Communication, SAFETY4SEA, Union of Listed Companies.